Leverage the robust features and configurability of FireLight® Sales Platform across all FireLight sales activities to digitally transform and grow your entire sales process. FireLight® Sales Platform provides the architecture, API layer and administration and testing tools to support various FireLight sales activities, providing carriers and distributors a comprehensive solution that expands unique business strategies, sales channels and use cases, efficiently enhancing back office and front office sales processes. Create your unique sales experiences and gain key end-to-end sales data with the robust features and sales activities of FireLight Sales Platform. FireLight provides a full service sales platform to create and manage user experiences, business rules, workflow configuration, integrations, and sales activities for all lines of business, eliminating the need to support multiple systems. FireLight is organically developed, providing a single technology solution that supports carrier and distributor business needs. With interconnected sales activities and user experiences, FireLight enables you to create an intuitive and seamless sales process for advisors and consumers through the entire sales cycle, from pre-sale to servicing the policy after the sale. FireLight includes a comprehensive Admin System that serves as a maintenance portal, providing the tools to self-manage FireLight sales activities and environments including rules, data collection processes, workflows, user experiences, and more. FireLight delivers flexible data definition and collection, meeting unique sales requirements and processes. FireLight puts the flexibility and tools in your hands to create unique and cohesive sales experiences that fit your various sales needs. 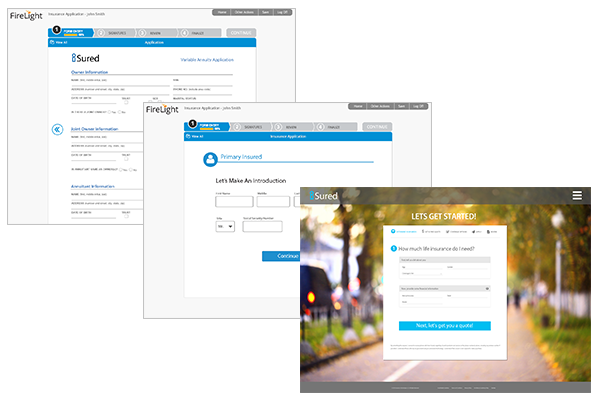 FireLight offers multiple user interface and user experience options including forms, wizard, and consumer experiences, supporting omni-channel and unique sales strategies. With FireLight Embedded, you can even make your FireLight services available within third-party solutions. FireLight single code base, robust API layer and automatic tracking allow you to capture end-to-end sales data across the entire sales experience from all data streams. FireLight robust reporting gives an exclusive and custom view into sales statistics, sales trends, usage analytics and audit and compliance tracking, providing you key business and sales intelligence. FireLight supports multiple data file formats for outbound and inbound transmission, including ACORD 103, Depository Trust & Clearing Corporation’s (DTCC) Applications & Premium (APP) and Subsequent Premiums (SUB) services, third party and proprietary file formats. FireLight provides the flexibility for you to use the file format that best fits your business needs. FireLight delivers a robust API layer to unite with external systems, enabling you to build custom workflows, sales solutions and capture data across the complete sales experience. FireLight API layer delivers expanded data, action, service and experience centric sales capabilities to expand your FireLight use cases and support unique sales strategies. At no additional cost for FireLight transactions, FireLight provides a proprietary e-signature feature with multiple signature capture options in both connected and offline instances, which can be used across all FireLight sales components, processes and workflows. FireLight supports the reuse of business rules, user experiences and integrations across all FireLight sales components, increasing operational efficiency. Create rules once, reuse them throughout different sales activities and deploy to different channels. FireLight unified data modeling minimizes integration implementation and management, saving valuable time, money and work. 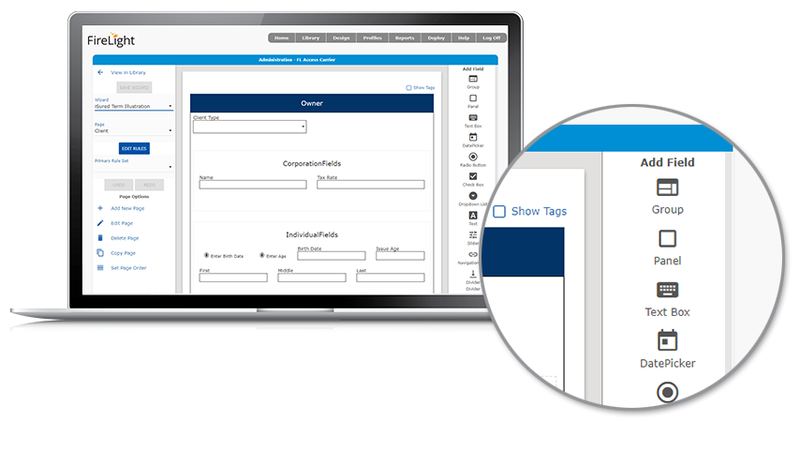 With the Form Designer and Wizard Designer tools in the FireLight Admin System, carriers and distributors can quickly self-create and implement their own unique and fully responsive form and wizard user experiences for all their FireLight sales activities. The designer tools enable you to create user experiences that fit your consumer and product offerings to deliver enhanced and intuitive sales experiences. Enable anytime, anywhere sales with FireLight connected and disconnected functionality. FireLight works securely on any connected device through standard browsers and provides disconnected capabilities across multiple sales activities. Provide your advisors mobile sales access to capture in-good-order sales and electronic signatures, increasing sales productivity. FireLight Access™ is a user management and application download administrator tool that enables distributors to quickly manage advisor access to FireLight and support record retention processes. FireLight Access provides distributors with limited technology resources, and no integration or single sign-on requirements, to quickly onboard their advisors to FireLight. With a multi-carrier environment, distributors can provide their advisors with quick and easy access to multiple carriers and products to support their clients’ complete financial and retirement needs, optimizing sales opportunities. FireLight® provides a single-code-base full service sales platform to create and manage user experiences, business rules, workflow configuration, integrations, and more across the various sales activities and lines of business for a cohesive selling experience, eliminating the need to support multiple systems. The FireLight platform provides the framework, architecture, delivery systems and administration and testing tools to support Pre-Sales Functions, Quoting & Illustrations, eApplication, eDelivery and Post-Sales Services as well as unite external systems to the FireLight Sales platform experience. FireLight® provides multiple e-signature options including in-person e-signature, click wrap e-signature and on screen tablet e-signature. At no additional cost for FireLight® transactions, FireLight provides a proprietary e-signature feature with multiple signature capture options in both connected and offline instances, that can be used across all FireLight sales components. Incorporate e-signature into any sales process to meet unique workflows. FireLight provides you the flexibility to ask questions and collect sales data in a forms/application, wizard or conversational user experience across the different FireLight sales activities. Design user experiences to support unique distributor, advisor and direct to consumer sales processes. FireLight® single code-base for all FireLight sales activities along with the robust API functionality, allows extensive reporting across the entire sales experience, providing key business and sales intelligence. Capture end-to-end sales data across all sales activities from Pre-Sales Functions, Quoting & Illustrations, eApplication, eDelivery to Post-Sales Services. FireLight® provides unique flexibility and tools to define and meet unique workflows, regulatory requirements and sales processes. Wizard Designer is an intuitive, drag-and-drop design tool within the FireLight Admin System, that you can use to create and implement fully responsive wizard user experiences. FireLight® Sales Platform Wizard Deisgner with the FireLight Administration System enables carriers and distributors to build their own unique and fully responsive wizard user experience for all FireLight sales activities. Maximize the reuse of rules across forms and wizards, or create new rules that are applicable only for the wizard experience.